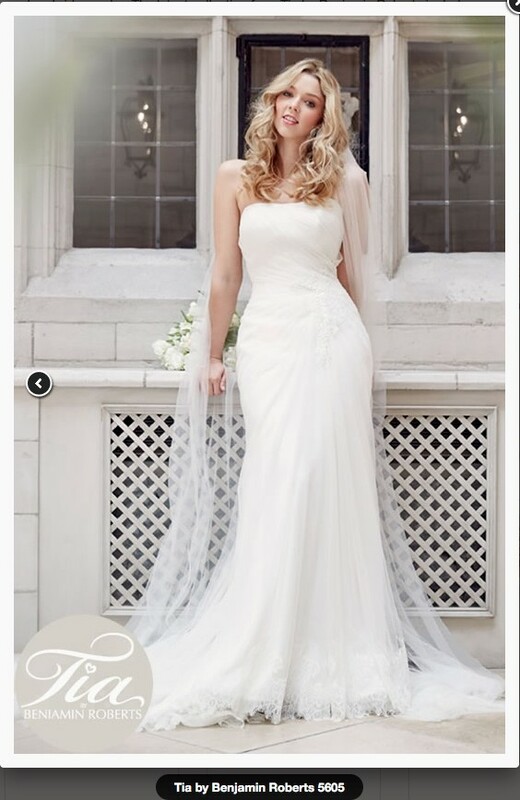 Stunning soft tulle strapless ivory lace gown, beautifully detailed and superbly cut to really fit and flatter. It has a sweetheart neckline with soft rouching to the bodice and skirt as well as gorgeous hem lace detail. I particularly loved the herringbone effect on the side where the diagonals of the chiffon meet. Photos also show the applique on front and crystal beading on back. There are a couple of small holes in the lace at the back of the train (see picture) - not noticeable when wearing and would be able to be repaired. Price reflects this. It’s too beautiful a dress to be kept hanging in a wardrobe and I hope someone else gets as much pleasure from it as I did. Happy to post to the UK if that helps for extra cost. This dress was purchased as size 12 and has been professionally altered to fit bust 35” and waist 28” (roughly size 11). There is a built in bodice and as you can see in the photo I had cups sewn in but these could easily be removed. The train is a good length and has been altered to bustle up in a flattering way or wear full flowing. I am 5'7 and I wore standard 2” heels and the lace hem skimmed the floor beautifully.